Posted on Mon, Feb 20, 2012 : 10:16 a.m.
U.S. Rep. John Dingell, D-Dearborn, at a campaign event in 2010. U.S. Rep. John Dingell, the 85-year-old Dean of the House, is featured in a new Vanity Fair article that seeks to get to the bottom of the divisiveness in Washington. And who better to ask than the senior sitting member of Congress who has served continuously since 1955 and seen it all? "This place is about as poisonous as I've ever seen it in my career," Dingell tells Vanity Fair. "There is little room for moderates. It used to be that when we'd get a bill that we'd really need, we could always count on some across-the-aisle dealings. No more." Not only is Dingell the longest-serving member of the House in all of American history, but as Vanity Fair points out, he's within 17 months of breaking the late Robert Byrd's record for total combined congressional service in the House and Senate. Commenting on House Speaker John Boehner's difficulties in controlling an "unruly flock," Dingell said: "I am still trying to figure out why Boehner wants that damn job." Wed, Feb 22, 2012 : 4:28 a.m. The man has been in Congress longer than a lot of the people he &quot;represents&quot; have been alive. He spends little or no time here and then has the balls to come back and speak about the problems in Congress? People like him are the problem...too bad the dopes of this area keep electing the corpse that has put in place many of the policies that have been killing this country. Tue, Feb 21, 2012 : 5:29 p.m. If I could ask Dingell one question it would be... How do you vote for a health care bill you never read? Talk about voting party lines. Wed, Feb 22, 2012 : 6:36 p.m. The same way all your Republican heroes voted for that Drug Deallers, Drug Pushers free market drug bill. You know how that free market includes those famous no-bid contracts. But it's ok, we understand your limited knowledge of such events!! Tue, Feb 21, 2012 : 1:03 p.m.
All we have to do is read the comments here to know that Dingell is correct. We can also think the talking heads, and the those that get the most listeners/eyeballs are on the far right. Constant whining and crying, and government by stereotype is no way to run a country. 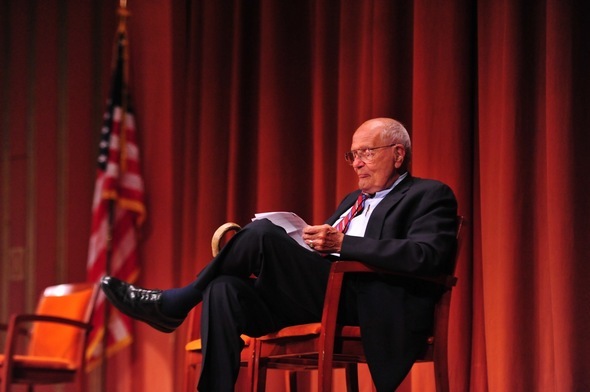 If you think Dingell is so bad, go out and sign up for his job, it is open every two years. Tue, Feb 21, 2012 : 5:34 p.m.
Just because I disagree with Dingells position on just about everything doesn't mean I would like his job. Although, there are plenty of qualified people I do agree with that will take it. Tue, Feb 21, 2012 : 5:54 a.m.
Dingell gets re- elected because of the way the his district is carved out...Ann Arbor was included into his district to ensure his votes. The only time you see his face around Ann Arbor is for camera time. When President Obama was here and when the Stadium bridge finally began repairs. He took some of the credit for that. Maybe he drove the President's car over the bridge to show him that the Re-Investment funds were needed to get the project going. HaHa. Please, John step down. You are a huge part of the problem. It is getting worse not better. Open your eyes if you still can. I'm sure at the start of your political career you really intended to help and make a better america. But, now you are only hurting america. Tue, Feb 21, 2012 : 4:35 a.m. The reason Dingell is the longest serving Congressman in the House is because his constituents have voted for him every two years since 1955. So apparently he is a consistent winner despite who runs against him or &quot;cuts him down to size&quot;. The article, however, is about divisiveness in the House. Before all the vitriol about one individual lost track of the topic, it could have created a possible opportunity for some discussion on it. Well, with this crowd, I guess that wasn't likely anyway. Tue, Feb 21, 2012 : 12:28 a.m. I'm sorry; it's truly easy to complain about long-standing career politicians being part of the problem, or THE problem... But do we have any reason to believe that the ones who, for instance, shuttle between the boardrooms and the corner offices or the lobbying firms and Congress perform any better?! Do we? Mon, Feb 20, 2012 : 11:01 p.m.
Jam bad legislation down the throats of Americans like Obama care without even a proper reading, and you wonder why there is so much poison out there. We're going broke because of guys like Dingell and yet we keep electing him! Tue, Feb 21, 2012 : 7:18 p.m.
Harry, I agree with you. Dingell was one of the voters that DID NOT read the bill before voting on it. After days of answering the question &quot;Did you read the bill?&quot; He would reply by saying he helped write the bill, but never actually said if he read the bill until one day he messed up. He told a constituent I will have to read the bill because I didn't know that when responding to a question about something in the bill. By the way, Pelosi said &quot;We will have to pass it in order to know what is in it.&quot; Not Obama. Tue, Feb 21, 2012 : 5:55 p.m.
Maallen You are absolutely correct. The bigger question is how do you vote on important bill like this WITH OUT EVER READING IT. As Obama said &quot; We have to pass this thing so we can see whats in it&quot; Clownfish- Dont you have a problem with this? Tue, Feb 21, 2012 : 1:28 p.m.
Clownfish, Just in case you didn't know the Affordable Care Act is also known affectionately as ObamaCare. Smell the coffee! The GOP did participate in the discussion at the very beginning, but was told point blank that none of their ideas would be taken into consideration. So what was the point in being at the table if all they could do is watch, but not play? And whatever happened to Obama's promise that it will all be transparent? The whole ObamaCare was everything but transparent. They met behind closed doors and made backroom deals just to get it passed. Hardly above board. Tue, Feb 21, 2012 : 1:08 p.m.
What is &quot;Obama Care&quot;? There is no such thing, as far as I can tell. Does your physician take &quot;Obama care&quot; as payment for services? Now, if you are trying to discuss the Affordable Care Act...If the GOP had problems with it, they could have participated in discussions, instead they stood outside and cried. What is even more hypocritical is that many that used to support a health insurance mandate (because it IS about personal responsibility) are now against it, because a black guy got it passed. We cannot have it! We must whine.moan and talk about &quot;death panels&quot;. Mon, Feb 20, 2012 : 10:55 p.m. I believe all in congress need to take some lessons in being responsible, fisically and morally. Too many of them are there for their own being and becoming millionaires on our tax payers dollars. Mon, Feb 20, 2012 : 10:23 p.m.
Would Mark Ouimet consider taking on JD? I believe Mark is in this congressional district? A friend of mines DAd died while my friend was in his second tour of Vietnam. His Mom had no money and three small kids at home. I talked to the Dearborn Veterens Bureau and they put me in contact with Mr Dingell. I explained the situation and within two weeks my friend was home and discharged from the Air Force. Mr Dingell then got him a job with the city of Dearborn so he could support his family. Dingell has never embarrassed the House of Representatives like so many others have done. I will vote for him until he retires. Thanks Mr. Dingell. Tue, Feb 21, 2012 : 5:09 a.m. Sorry time for dingell to move over. His time has passed. Tue, Feb 21, 2012 : 2:09 a.m.
That was 40 years ago. It is now time to move on and let someone else take his place. I have been voting for the other guy the last 10 years and he is still there. Go figure. Mon, Feb 20, 2012 : 9:30 p.m.
Mon, Feb 20, 2012 : 8:58 p.m.
Democrat or Republican; now would be a good time to NOT vote for the incumbent. Then lets see if &quot;they&quot; get that message. Mon, Feb 20, 2012 : 8:47 p.m.
Mon, Feb 20, 2012 : 8:30 p.m.
they don't want to really fix anything they get elected to get RE-elected so they can get their cushy pensions and healthcare which is better than any private sector job. politics in America is the most corrupt it has ever been, Democrat or Republican non of them really care about the average American, its all power and greed and partisinism. the only way to force our poiticians to fix healthcare is to make them be on the same plan only way to fix Social Security is to make them be a part of it, the stole all that money for thier own greedy programs. that money was never to be touched by the thieves in Washington but they go around the constitution anyway they can and steal our tax dollars. Disgusting. These &quot;career&quot; politicians are part of the problem. They have lost touch with the real world. Serving in his position for 57 years is absurd! Adding up all the years the Dingell family has been in power, would probably be close to 100 years. I vote for term limitations! How about TOTAL problem. What a shame this old man can not see the problem. He would have to be stinking his head in a hole to not see the total mess. Mon, Feb 20, 2012 : 8:32 p.m.
&quot;Part&quot; of the problem? They ARE the problem!!! Mon, Feb 20, 2012 : 7:20 p.m. I remember GOP state house representative nominee Chase Ingersoll cutting Dingell down to size at a debate in 2010. Draft Chase Ingersoll for U.S. Congress! Mon, Feb 20, 2012 : 9:12 p.m.
Mon, Feb 20, 2012 : 7:15 p.m.
Dingell is so good at pointing a finger at someone else, but he fails to realize while he has one finger pointing at the other person (party) he has three pointing at himself. It is time for him to look in the mirror and ask &quot;What can I do to change this &quot;poisonous place?&quot; One answer might be stop blaming the other side. But a better answer is not to run for re-election. Tue, Feb 21, 2012 : 1:20 p.m.
Tru2Blu76, You just proved my point. You are sitting there pointing your finger saying &quot;It's someone else's fault!&quot; Classic. It is both the democrats and republicans fault. You can sit there and debate all you want as to who is more at fault than the other, but what good will that do? When someone sits there and says &quot;It's their fault!&quot; then that person needs to look at himself or herself. Instead that person should be asking &quot;How can I help to make this better?&quot; Obviously continiously blaming the other side isn't working. Tue, Feb 21, 2012 : 6:43 a.m. If there are &quot;three fingers pointed at Dingell&quot; - then he wouldn't be reelected for the past fifty years. It may be true that he's reached the end of his career, but that's not any kind of recommendation for &quot;the other side.&quot; It's a matter of general knowledge that the Republicans started this planned divisiveness. Divide and conquer: the voters - by lying and peddling propaganda. $2.323 billion spent on Iraq, $900 billion spent bailing out crooked corporations, additional 100s of billions spent 'cleaning up&quot; Afghanistan because of Republican neglect of that campaign. ALL of that and untold billions more lost BY Americans due to the Republican-caused recession. But, oh, you're too distracted to notice that little &quot;detail&quot; - so you spend your time defending the Despicable. Mon, Feb 20, 2012 : 6:49 p.m.
@TruBlu76 Yep, I read the article. Let me summarize: "This place is divisive, and it's all the other guys fault." The Democrat spend ¾ of the article complaining about the Republicans and wonders why there is so much partisanship. Classic. Tue, Feb 21, 2012 : 1:58 p.m.
Trublu76 said: &quot;. It's Republicans ..... threat to all Americans.&quot; &quot;crooks and liars&quot; &quot;seditious lies of the Republicans&quot; Nope, can't understand where all the diviveness comes from, can you? Probably name calling has nothing to do with it? Nah. Couldn't be. Classic myopic post. I need to bookmark it. Thank you. Tue, Feb 21, 2012 : 6:04 a.m.
Just a refresher in Reality 101: it was the Republicans in Congress who TWICE blocked raising the debt ceiling last year: even though they KNOW that would cause another economic collapse. That's the SECOND TIME, the first economic collapse actually created by Republicans is the one we are STILL living with. Congrats on your &quot;perspicacity&quot; - it's too bad you won't admit the truth. It's Republicans who started the divisiveness and that is a threat to all Americans. If you want to waste your time campaigning for crooks and liars: then that's your choice. Fewer and fewer people are believing the seditious lies of the Republicans - and independents like me are leading the campaign against them. Tue, Feb 21, 2012 : 4:27 a.m. The Republicans spend 3/4 of their time complaining about the ineffectiveness of goverment while doing everything in their power to make sure it is ineffective. Brilliant! Mon, Feb 20, 2012 : 6:03 p.m. I hope independent thinkers reading this piece which quotes Congressman Dingell NOTICE that most of the comments here are negative and directed SOLELY at Dingell - whom they obviously believe is a &quot;Liberal.&quot; NOTHING is said about the central point of the article: Vanity Fair Magazine is trying to &quot;get to the bottom of&quot; the divisiveness in Washington. (meaning: IN CONGRESS). Anyone so obsessed with supporting their &quot;favorite&quot; ideology is not interested in doing any good - only in &quot;soldiering&quot; for their shoddy thinking and beliefs. If they had BOTHERED to read the Vanity Fair article: they'd have found a clear-cut description of the way Republicans behave &amp; operate: NO compromise in anything, for any reason: including the welfare of the American people. Any rational American would be (and many are) alarmed at this &quot;we'll have it our way or no way at all&quot; strategy. As a former Republican activist: I can vouch for the truth of this charge. The &quot;no compromise&quot; idea sprang up some time around 2000 or before. It was &quot;a popular notion&quot; which became an entrenched &quot;principle.&quot; Just explain: how such a strategy FITS in our democracy?? Wed, Feb 22, 2012 : 1:49 a.m.
TruBlu - You might try some of the independent thinking yourself. You appear only to be able to see one side of the story. Sorry, Tru, but both parties are at fault. Open your eyes. No much sense in encouraging people to think independently when it is obvious that, to you, if they do so, they will, naturally, think as you do. True diversity of opinion is enlightening, not constricting. Mon, Feb 20, 2012 : 6:50 p.m. Please. This might be a valid argument if the Republicans didn't threaten filibuster on EVERYthing the Dems wanted to do, forcing a 60/40 majority need, which we didn't have. Not quite what your precious Founders had in mind, by the way. Mon, Feb 20, 2012 : 5:47 p.m.
Mr. Dingell IS the problem, and should resign immediately. Tue, Feb 21, 2012 : 7:04 p.m. The incompetence and narrow-mindedness of the Republicons is the problem. Good Night and Good Luck. Hey John where is our train bridge at Allen and Vreeland Rds you build them for everyone else. .Woodhaven,Trenton,Brownstown and Grosse Isle.residents want to know. Dingell, whose wife worked for the auto industry and now lobby's on it's behalf taking advantage and probably affecting the legislative interests and efforts of her husband for years, I'd say Dingell is part of the problem. Rep Dingell has more time in the House of Representatives than any other member. As the senior member, it is his role to help set the tone of the House. He has failed in this task. If he does not like the attitudes, he has only to look in the mirror. It is time for him to step down. This is the perfect time, there are fewer seats in the state, and he has the opportunity to hand a safe seat to someone else in the state who has seniority in the House. Right now, one of the Democrats in South Eastern Michigan is going to lose out. He only seems to care about the state when elections are close. This year you can expect that he will ride in the Heritage Festival Parade and throw candy to the crowd, only in election years does he do this. He was sidelined by his own party on the Energy Committee and has lost their respect, so it is not just the Republicans that he has problems with. Tue, Feb 21, 2012 : 6:28 a.m.
Actually, Dingell is THIRD in time served. Blaming him for &quot;failing&quot; in the face of a planned campaign of obstruction and divisiveness carried out SOLELY by Republicans hardly reflects well on your knowledge - or possibly your honesty. Mon, Feb 20, 2012 : 4:31 p.m.
Time for JD (I do not mean Jack Daniels) to move on to a new career! What ever happened to hope and change? Mon, Feb 20, 2012 : 4:28 p.m. Millions of Americans without jobs or hope. Trillion dollar deficits. A bloated and corrupt welfare state. The policies that got us here are the policies that John Dingell has consistently voted for. Tue, Feb 21, 2012 : 12:59 p.m.
Tue, Feb 21, 2012 : 6:23 a.m.
&quot;bloated welfare state&quot;-?? Hah! Have you EVER looked at a federal budget in YOUR LIFE?? Bloated: Military State. The U.S. spends 3X what Red China does on its military and 5X what Russian spends. Who is responsible? It started with Reagan's Star Wars project and has continued on beyond the presidency of G.W. Bush - in the form of continued spending on Iraq and &quot;catch up&quot; spending on the Afghanistan War as well as bloated contracts to the military industrial complex. Americans without jobs: it was Bush and the Republican Congress who let corporations go unregulated - the very thing that made it possible for crooks to destroy the financial and real estate markets which LED TO the worst recession since the 1930s. THEN Bush &amp; the Republicans provided FREE billions of dollars to save those same banks and investment firms. Start caring for America and Americans, start questioning the propaganda you've been duped by for the past 10 or 15 years. Mon, Feb 20, 2012 : 4:04 p.m.
Everyone in the Congress points their finger at the other person as being the 'problem'. It doesn't seem like Dingell and the others who have tenure are doing anything to solve the problem. They play off of this gridlock to misdirect us so they can get re-elected. Dingell could do us all a favor and use the end of his career to clean up the Congress. Mon, Feb 20, 2012 : 3:35 p.m.
Tue, Feb 21, 2012 : 12:41 a.m. He doesn't have to ACT is if he's been in Congress forever. He really has. Mon, Feb 20, 2012 : 8:48 p.m.
Mon, Feb 20, 2012 : 3:39 p.m.
the problem isn't the length of any Congressperson's tenure, it's the level of partisanship that seems to have forced any good politics to the side. Our current legislature cares more about pushing the party line than making compromises, like they're supposed to do.